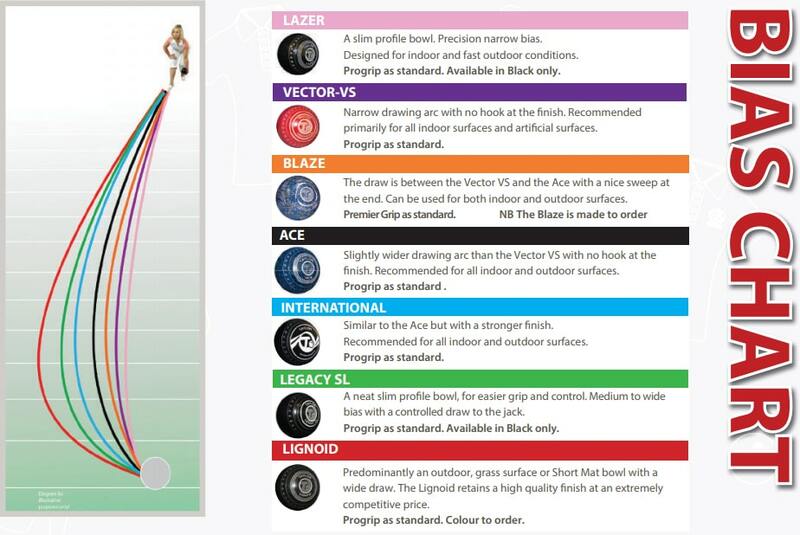 Your choice of lawn bowls will depend on many unique factors, and at the end of the day will boil down to personal preference and the requirements you have for how you play. These will include what position you play, where you play and how you play! There are a number of options available to you whether you play indoor or outdoor bowls. Variations in bias and size and weight of the bowl will be the main options you'll need to decide on when choosing your bowl. 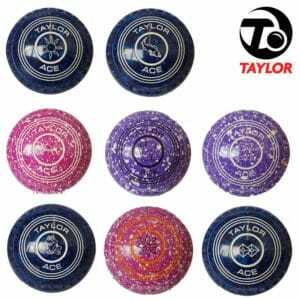 It can be quite a tricky task, especially if you do play a mixture of indoor and outdoor bowls and only wish to purchase one set of bowls. You may have to compromise somewhat and choose a bowl that suits the indoor surface predominantly and use them to the best of your ability for the outdoor games. The variation between a slower often wet and heavy outdoor lawn is just too great compared with a faster indoor green. You won't find any one set of bowls that is suited to both conditions and unless you choose to buy two differing sets of bowls a compromise will need to be made. Which Lawn Bowls Bias to Choose? Unlike the crown green game, where a 2-full bias is standard, the flat green game offers more selection when it comes to choosing a bowl and its bias. So which bias is best? It's a tricky question to answer and will depend on where you play and how you play. It's usually a case of looking at the manufacturer's bias charts and getting an idea of each model's bias trajectories and making a decision from there. Just by seeing the visual trajectory of the various bowls should give you a good idea of which models to eliminate from your selection. Other factors that you should bear in mind when choosing a lawn bowl is the speed of the green on which you will be playing on. Will you be mainly playing indoor bowls or will it mostly be outdoors play? As a general rule, the faster the playing surface, the narrower the bias trajectory so keeping that in mind should also help with your decision making. 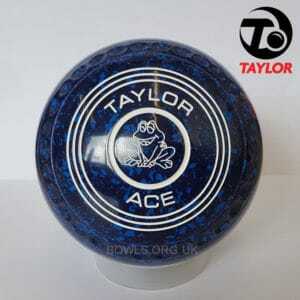 If you're playing or taking part in league games and competitions at other clubs then either a bowl narrow or wide may be a more suitable choose. The position that you play will also be a consideration, for example if you play skip a wider drawing bowl may be a more suitable choice as you'll need to be able to angle around the bowls already at the hand. On the other hand if you're playing lead, a tighter drawing bowl would be more favourable as you won't need to compensate for any bowls already delivered. At the end of the which bias to choose comes down to personal preference. There are no rules on what bias you can or cannot use in any aspect of the flat green game - whether that be indoor or outdoor bowls. It's simply a case of finding a bowl that's right for you, and your style of play. The chart below highlights the bias and different trajectories of the various models from the manufacturers that we currently stock. This visual guide should help you to further refine your choices of bowls and which to consider purchasing. Which Weight and Size Lawn Bowls Should I Buy? 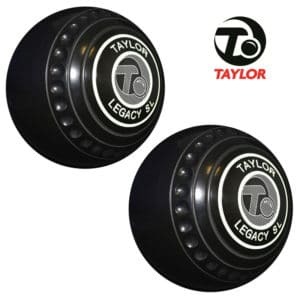 Similar to our recommendations with buying crown green bowls, unless you have a physical impairment opting for the largest weight bowl that you can grip and handle comfortably is generally the best choice. It's always useful to try a few different sizes before making a decision, so if people see what size bowls your fellow club members use and whether they would mind you trying them out to get a better idea. Whilst we usually recommend you opt of the heaviest bowl you can grip and handle comfortably, your ability to hold and grip the bowl shouldn't be compromised by the need to go heavy with the bowl. A heavier bowl will carry more momentum on the green therefore it will require less effort to bowl and overall should make for a more accurate and consistent bowl. The blow chart details the weight and physical size of the bowl and their corresponding manufacturing sizing. We will add subsequent sizing and weight charts for all the flag green bowl manufacturers that we have in stock. 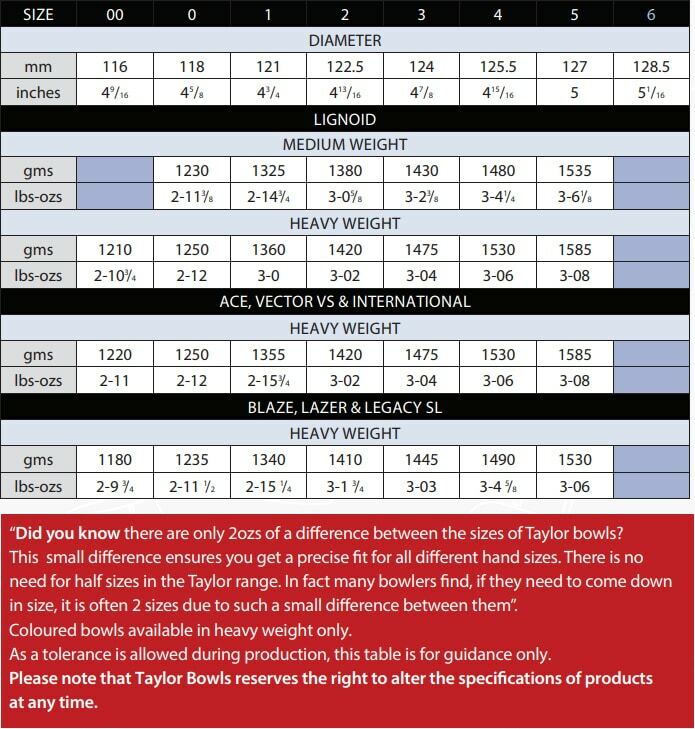 Below if the chart for the Taylor bowls flat green range.